All students must agree to the Course EULA. Registration means EULA consent. 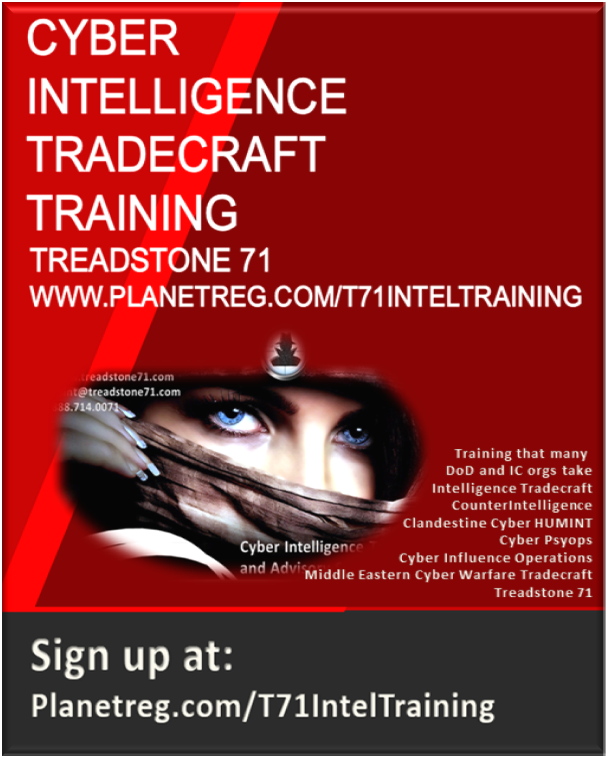 "I completed Treadstone 71’s Cyber Intelligence Tradecraft Certification Training in March 2018. Although I had attended numerous cyber training courses in the past, I found this course to be the best cyber training course ever. The instructor, Jeff Bardin, is a top-notch teacher who has the actual experience and credentials to effectively present the subject to students. In addition to his deep experience, Jeff’s wonderful personality and his passion for cyber intelligence make him a second-to-none instructor. The majority of the classes dealt with intelligence analysis, a subject other cyber intelligence courses fail to cover effectively. I give this course five out of five stars and I highly recommend it to government and private sector employees who want to learn cyber intelligence the right way." As technology constantly and rapidly changes, so does the way our information is attacked and gathered. Society is being shown, that not only in the cyber realm but in human intelligence gathering, the lengths people will go to in order to obtain information. Treadstone71 courses allow professionals on all levels, the ability to learn methods, techniques, and tools; to not only collect information, but to recognize and counter the gathering, analytics, and critical thinking skills utilized in intelligence and denial and deception. The hands-on case studies, scenarios and team presentations provide the ability for the extensive comprehension necessary to strengthen both your personal and professional intelligence capabilities. Mr. Bardin as an instructor is very cognizant, accomplished and well-informed in the realm of his teachings and the culture of Cyber Intelligence and Counter-Intelligence. I would highly suggest that anyone working in any sort of Intelligence, Security, System Administration, Information Systems Officer, attend his courses. I have had the privilege to attend two courses so far (Cyber Intelligence and Cyber Counter Intelligence) and look forward to attending as many as Treadstone71 has available. Don’t' miss out, be vigilant, be smart, be proactive." More courses to come include 2-day courses in Critical Thinking, Structured Analytic Techniques, Analytic Writing, and Dissemination. Course customization and new course development is only an email or phone call away. Come to train with Treadstone 71. Cyber Intelligence, CounterIntelligence and Adversary infiltration since 2004. Treadstone 71 helps companies and organizations build out their cyber and threat intelligence programs from strategic planning, process flows, standard operating procedures, interfaces flows into hunt and detect, persona development, collection management, threat intelligence production management and complete end-to-end advisory services. Since 2002, Treadstone 71.